Some marketing ideas are quite simple, others are plain out complex. Some concepts depict information in a very straight-forward fashion, you might even say, they are quite old fashioned... While others are almost deceitful. Whatever the marketing strategy used, some methods strike you as impressively smart... and that's just one of those strategies. Take a look at this website of a freelancer - what do you see, at a first glance? That's a big impressive list of brand names. This freelancer seems to have a very impressive portfolio, don't you think? A bit too impressive, I am afraid. 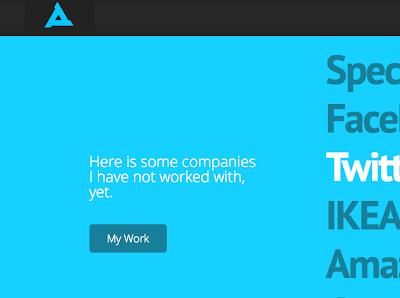 "Here is some companies I have not worked with, yet." Genius? I would say he is, despite the language mistake. This person understood the heuristics we, as web viewers, use to scan a website. Yes, we look at websites incredibly quickly. We focus on the big fonts, the bold, the supposedly relevant. He did not really lie regarding his portfolio. There is a link to his real work, right in front of our eyes. Yet, he manages to misguide a big fat chunk of his visitors... and no one can quite complain. This is what I would call smart marketing! شركة ركن المثالية تهتم بخدمات التنظيف بشكل عام فى اى مكان فالتنظيف من الخدمات المطلوبة لاستكمال الحياة والتخلص من الكثير من الضغوط والتوتر والتخلص من اى مشكلة تتعرض انتشار الطاقة السلبية فى المكان ، يمكن في أول أن نقسيم تنظيف يومي أو أسبوعي أوشهري أونصف سنوي أو سنوي.